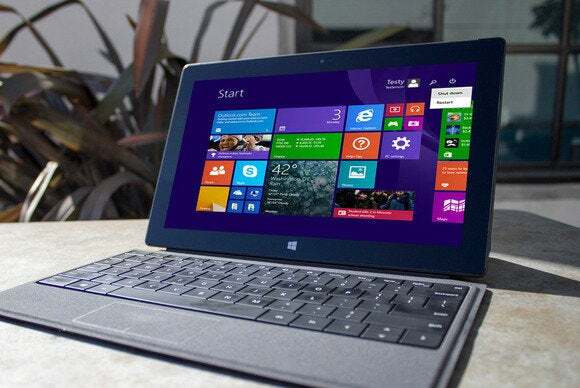 Following weeks of speculation and rumors, a purported early build of Update 1 for Windows 8.1 has leaked online and is available on a number of file sharing sites. The download reveals a lot of the features we’ve been hearing about since Update 1 screenshots started appearing. The update itself is expected in March or April. Before diving into the details, the usual caveats apply: Microsoft could cancel any of these features or hold them for a later update. So what we’re seeing here is more of a work in progress than a finished feature set for the next Windows update. That said, most of these changes are expected to survive the final cut and make it into Update 1. The biggest changes with Update 1 involves improving the modern UI experience for traditional, point-click-and-type PC users. 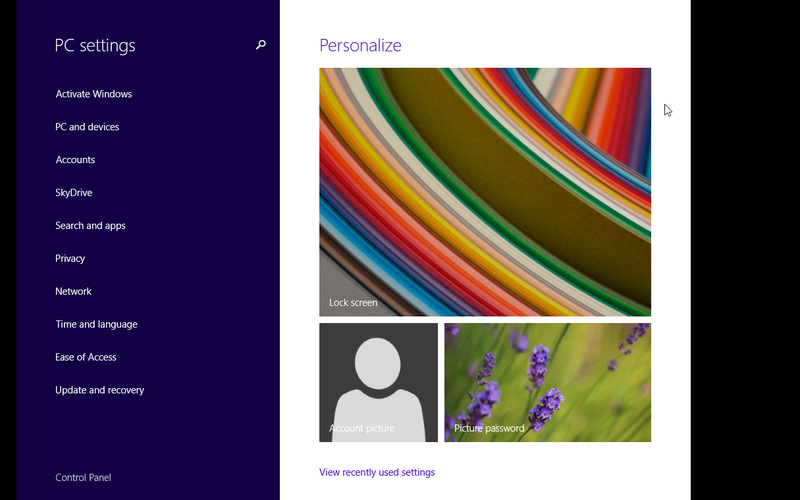 Microsoft wants to make it easier for point-and-click devices to navigate Metro apps. In the leaked build, Metro apps now have a title bar when you move your mouse up to the top of the screen, including options to close, minimize, and snap the app left or right. Microsoft has added search and power buttons to the Start screen in the upper-right corner (see image at top). Clicking on the power button gives you options to shut down or restart your PC, while the Search button simply calls up the pop-out search panel on the right. Right-click a modern UI app to see a desktop-like menu. Right-click on any modern UI app in the Start screen, and a desktop-style context menu appears with options to unpin the app from Start, uninstall, resize the tile, and turn off the live tile. 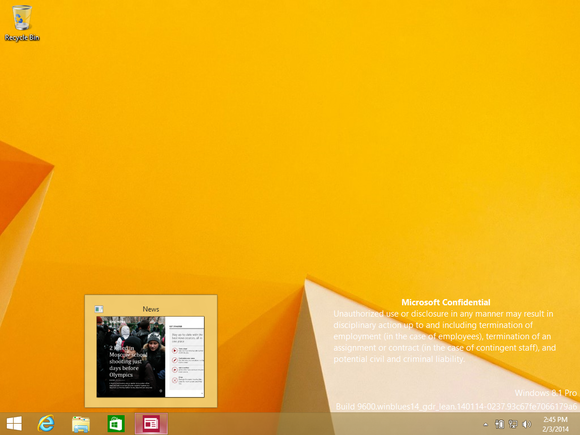 There is also an option to pin modern UI apps to the desktop taskbar, as previously reported. This new feature appears to be a stopgap measure in preparation for Window 9—when, rumor has it, you’ll be able to run modern UI apps in a windowed mode on the desktop. Hover over an open modern app pinned to the taskbar to see a preview. Pinning a modern UI app to the taskbar lets you hover over it to preview the app just like a normal desktop app. Clicking on a modern UI app pinned to the taskbar opens it in full-screen mode. Some modern apps display the taskbar until you start interacting with the app. It’s unclear if that’s by design. 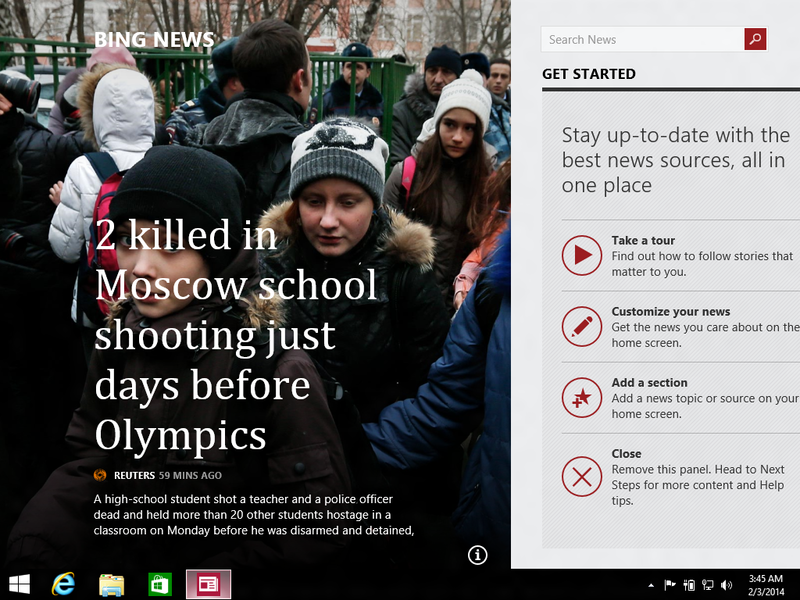 In this build, modern apps pinned to the desktop will sometimes display the taskbar after opening until you start interacting with the app. As The Verge first noted, it’s not clear whether this behavior is a bug or the behavior Microsoft plans to ship in the spring. The Mail app in Update 1 sure has a lot of icons. 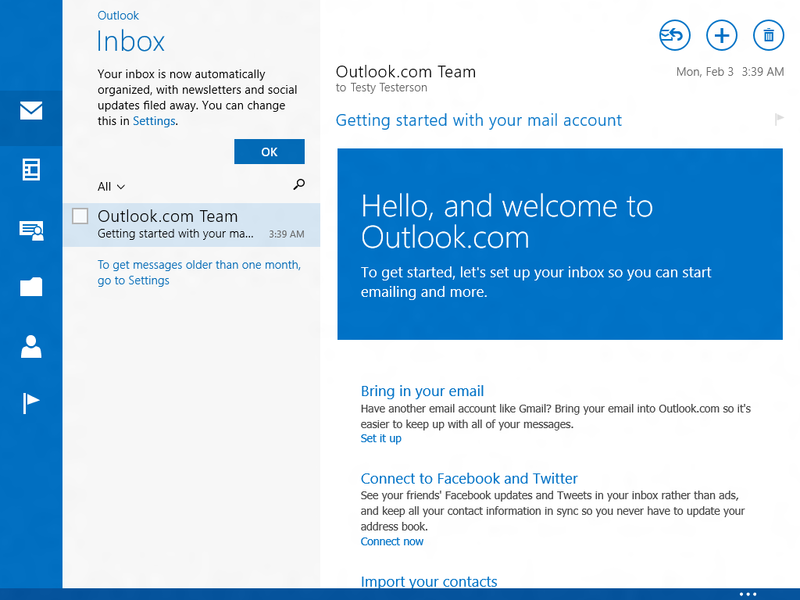 Microsoft also tweaked the interface of the Mail app, as you can see in the screenshot above. Quick access to the Control Panel. Finally, the PC Settings modern UI app has a link to open the good ol' Control Panel. One feature missing from this build, perhaps because the software was running in a virtual machine, was the rumored boot to desktop by default for traditional PC users. Overall, this early build of Update 1, apparently compiled around mid-January, is a very interesting appetizer, as we get closer to the official release coming in a few months.